An invitation letter is a formal request to invite a person to an event. It could be formal or informal for example, one can write it as an email or on a piece of paper. 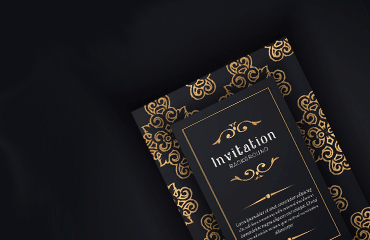 An invitation can be from an organization as well to invite a person or another organization to attend a particular function. It is possible to use an invitation letter on different events such as annual dinners, birthdays, and so much more. The invitation letter can be useful in inviting the guest speakers, and many other important people like these. Using a sample invitation letter can be of great assistance to any person as it would give an idea about the content of the relevant letter. It would be important to mention the person or organization’s name on the invitation letter. It is possible to print the invitation on a piece of paper and it is possible to send an email as well. Make sure the tone of the letter is relevant. It could be informal or formal. Write the letter in a pleasant manner. Invite the person or the relevant organization politely using the professional tone. Mention details of the function or event in the invitation letter. Make sure there are no spelling or grammar mistakes. Edit and proofread the letter. I, Mr. XYZ, am writing this invitation letter to Mr. ABC to invite him and his family at the wedding ceremony of my youngest daughter. The wedding ceremony would be at XYZ place on (date). This letter is a personal invitation to you and your amazing family. My wife is very fond of your family and we would love to see you at the wedding. Due to an extremely busy schedule, I and my wife cannot invite you personally and hence, I am writing this letter. We will be glad to have your presence at the dinner after the function. Please bring your family at the wedding ceremony. We would anxiously wait for your arrival. I hope this letter/email finds you in the best of your health. My youngest son is getting engaged and I am writing this email/letter to invite you to the event. Your presence in the engagement ceremony would be delightful for the couple. Please join us for the dinner as well. It would be amazing to see you at the function. Please let me know when you are booking the ticket, I will personally receive you at the airport. Waiting anxiously for your arrival. It would be grouping the employees together for the meeting hence, the relevant names would be included or it would be emailed to the relevant people. It would briefly discuss the agenda of the meeting. It would give the time and venue for the meeting. The writer of the letter would clarify the reason for the visit. It is attached with visa application and sent to the consulate or the relevant person or embassy. The tone of the letter would be professional. It would address the person or company by name. It would include the date, venue, and time. It would mention highlights of the event. Date of the wedding ceremony. Venue of the wedding ceremony. Time at which the guest is expected. The invitation letter for wedding ceremony would address the person by name and if family members are invited, it would be important to mention it in the letter. This letter would be inviting a person or organization to participate in a certain event, for example, inviting a person at the fundraising event. The letter would address the relevant person or organization. It would briefly highlight the purpose of the event. It would provide the date, time, and venue of the event.